The Springs in Fall — 2015 Photos #20: Three Cities, Much Rock « Midlife Crisis Crossover! 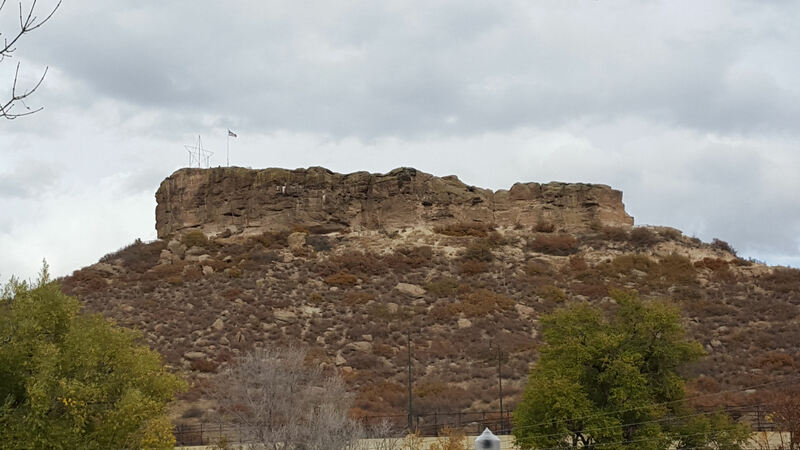 Castle Rock, a 37-story butte sitting next to the town of Castle Rock, Colorado. No relation to the Stephen King Literary Universe. Day Four was a busy driving day for me, trying to cover as much ground as I could before we had to fly home on Day Six. I spent the first half up in Denver and the late afternoon back in Colorado Springs, with a stopover in between to stare for a while at the formidable formation above. Works of God and of Man were each the order of the day. After another repetitive but free hotel breakfast, I headed the hour-long stretch straight up I-25 to Denver. Rockies to the west of me, flatlands around the rest of me till I reached the big city. The centerpiece in the distance is Turntable Studios, a 1967 13-story hotel that was recently converted into an apartment complex, with many living units as small as 330 square feet. So it’s bigger on the outside. 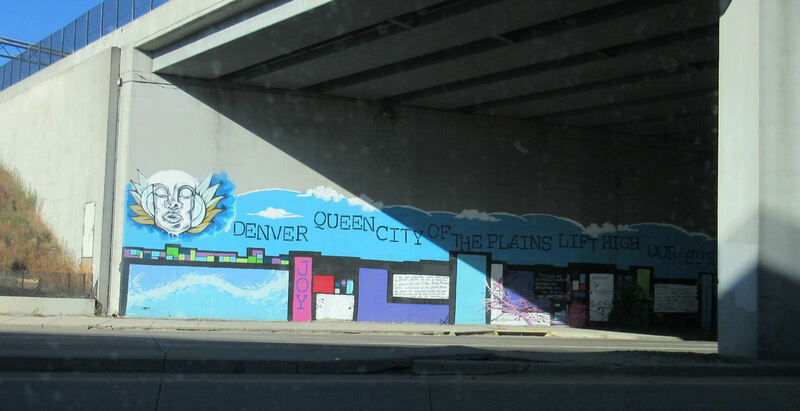 Painted in 2013, one of several anti-graffiti initiatives around town. 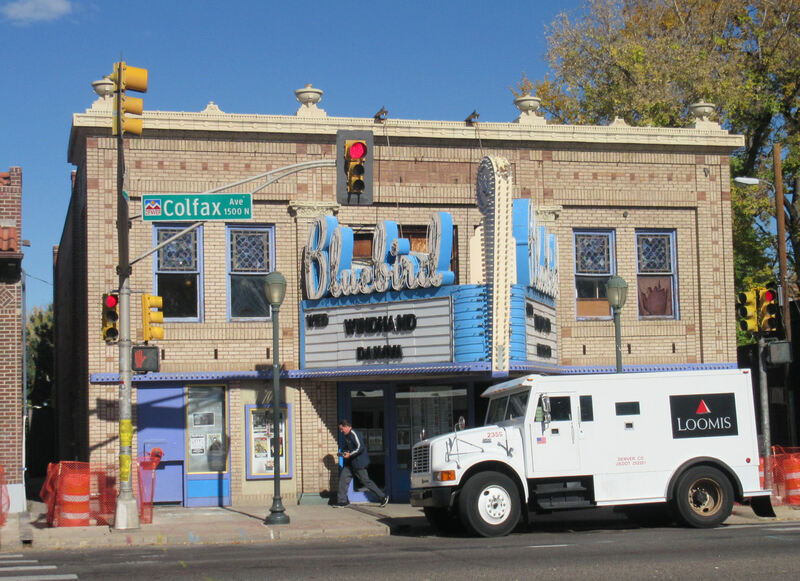 A bit further away was the Denver Biscuit Company, located on Colfax Avenue in the heart of the Bluebird District. The scrappy concert venue pictured below is said district’s namesake and another nice addition to my marquee collection. A quick check of their website confirms their lineup is either totally local or sufficiently modern, by which I mean I recognize nearly none of the names on the list except Atlas Genius. There was another joint across the street with flyers for an upcoming Machine Head gig, among other strangers. All in a Dream was at the other end of Colfax, not the most glamorous walk but I didn’t much care. I was there for the vibe, not to shop for Armani or crystal decanters or whatever you upper-class folks collect. Among the neighboring businesses, this one has the greatest name ever for a hair salon. 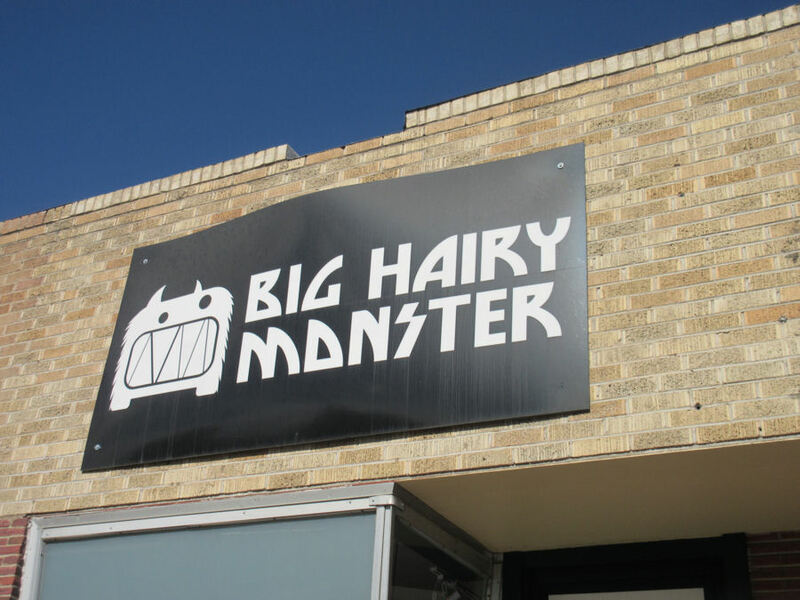 In a nice bit of great minds thinking alike from the Department of I Am Not Making Any of This Up, Big Hairy Monster has also been nominated for a local 2016 award for Best Name for a Hair Salon. If my vote were valid, they’d totally have it. 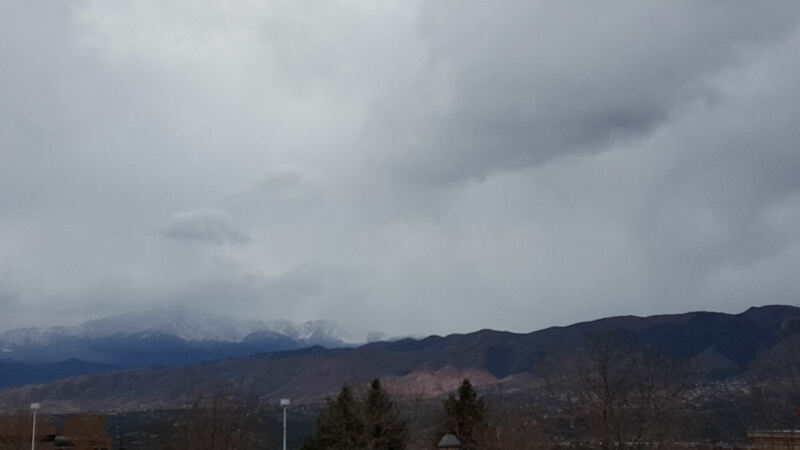 I finished my second round of comics shopping, hung around the Denver Museum of Nature & Science as freely as I could, then found my way back to I-25 once the clouds began to gather a bit ominously. 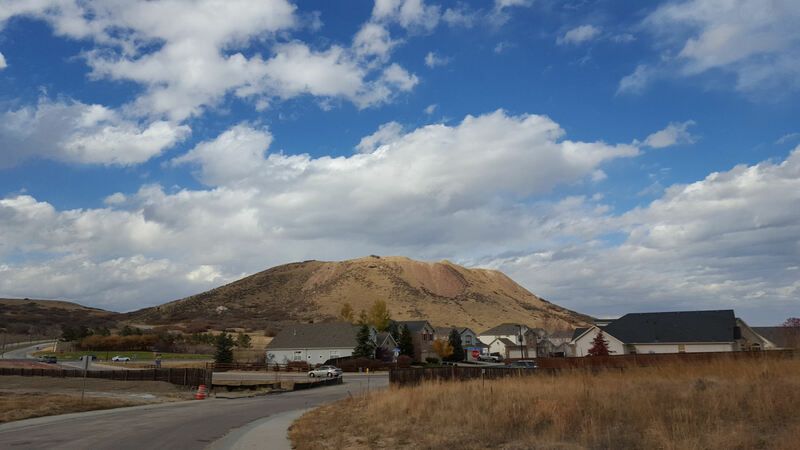 Midway between Denver and Colorado Springs is the town of Castle Rock, named after the natural castle-like rock next door naturally called Castle Rock. The story of this butte is it’s quite a beaut, and then they put a town by it. 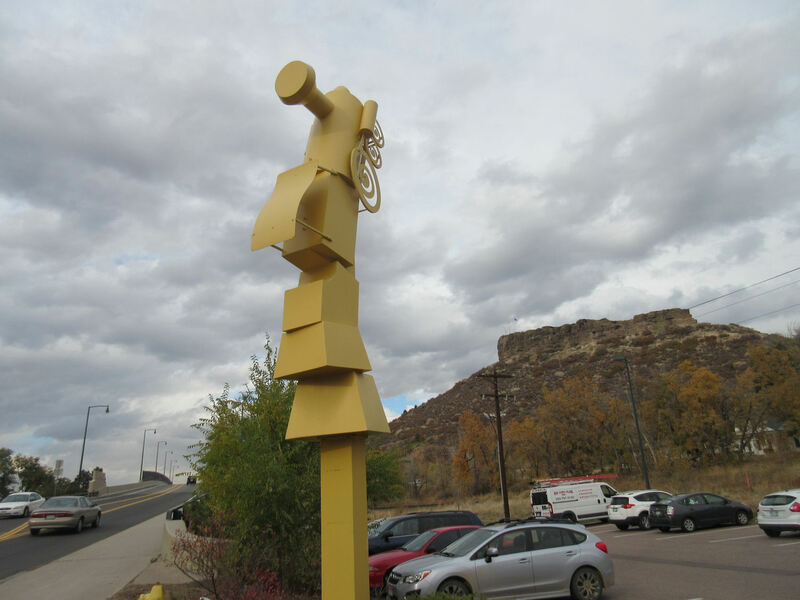 Random sculpture sits next to Castle Rock parking lot, possibly meant to be a Cubist portrait of some lesser Muppet such as a Koozebanian or a Fazoob. I needed to get a few things together and check some phone-related things, so I got off I-25 for a few minutes, accidentally headed west away from the Castle Rock rock and toward the Castle Rock community, and found a half-finished housing edition with some wide open space where I could park and linger for a bit without worrying any constabulary. Across the street, a spare Rocky Mountain sat alone, detached from its range. Alone in my car in a faraway land while my wife was trapped at work, I could identify with its weird isolation. Strangely, Castle Rock’s clouds were much nicer than Denver’s at the time. No comic shops, though, I bet. Later back in Colorado Springs once again, my next stop was the campus of Focus on the Family. Many Christians are familiar with them, particularly at our home church. Many non-Christians don’t have much use for them. Anne and I have read a few books by their founder, Dr. James Dobson, and found wisdom and practical use for them in past situations. I have their movie review site bookmarked and find it a useful source of anti-mainstream contrast . Their name kept showing up on tourist attraction lists, so I was curious to see what they offered. 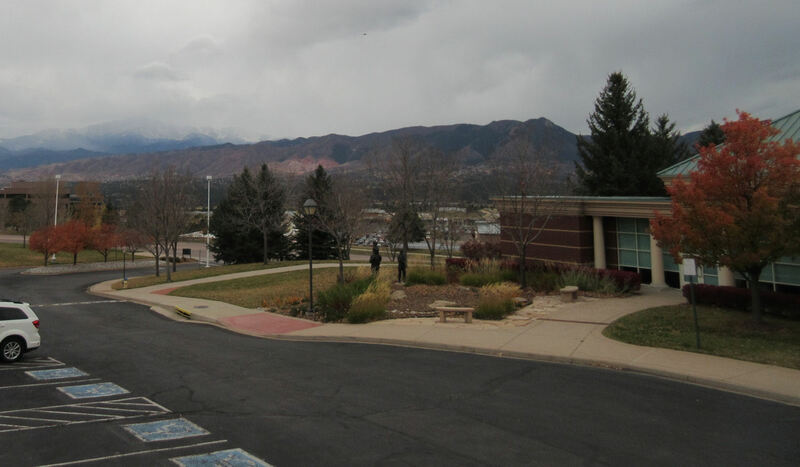 Their campus comprises several buildings of unremarkable lookalike brownness, so I turned to one side and added some Rockies and fall foliage into the shot for variety. I entered the Visitor Center and found myself the only visitor around. A few kindly, generous folks greeted and chatted with me for several minutes as we discussed this-‘n’-that. I don’t even remember what. Most of the Center has photos and displays telling the stories of the organization in general and the Dobson family in particular. They’re a bit inextricable. Free coffee and further conversation were offered, but I hated to impose. 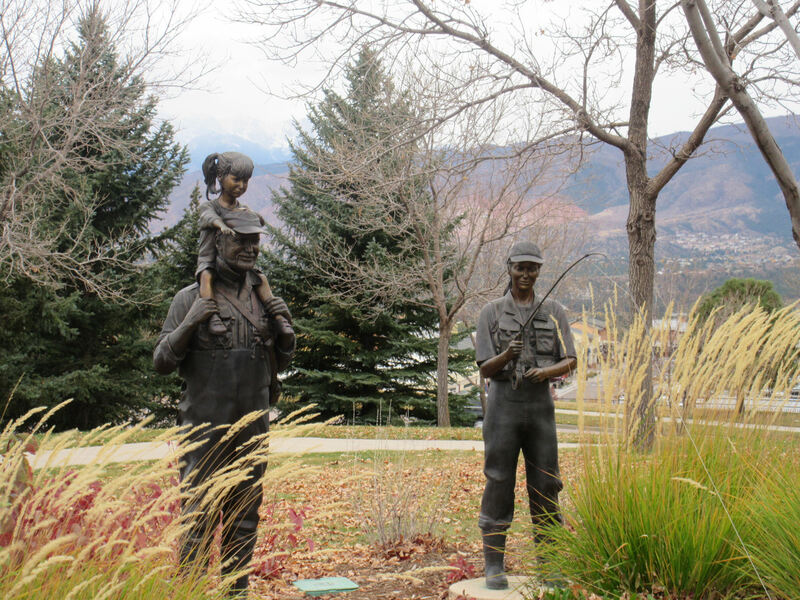 I found no plaque identifying these statues out front. I’m not sure if they’re figurative “fishers of men” or just a few of Dobson’s relatives. Next stop: slightly more shopping in downtown Colorado Springs. After a check-in at Escape Velocity Comics, I switched media and browsed around Independent Records — the tiniest, ostensibly coolest music shop in my path. I’m told we have something like somewhere in Indianapolis, but I have absolutely no idea where. 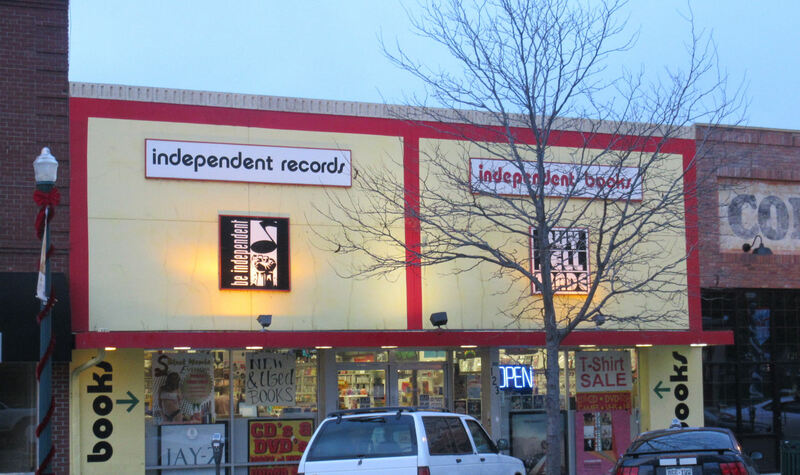 Many were the hours I spent between 1989 and 1993 kicking around all the record stores on Indy’s west side and grabbing music by obscure or soon-to-be-famous bands. And then every single one of those shop shut down by the end of the century. I found myself out of touch with 90% of their stock, but I’d picked up a few names from the local alt-rock station I’d been listening to in the car throughout my week. When you live in an area where the best CD shop is the nearest Best Buy, you’re positively starved for outlets like this. Final haul: alt-J’s This Is All Yours, which I would describe as “Band of Becks” and had some isolated moments of inspiration between stretches of aimless noodling; and Chvrches’ Every Open Eye, which went on to become my favorite CD of 2015. To their credit, the nice young lady at the counter didn’t openly judge me by my square appearance. Much appreciated. I’d hoped to spend some time afterward checking out the park across the street and snapping pics of its sculptures and installations, but the weather was reneging on its previous cooperative status and I found myself freezing. The beautiful skies and perfect temperatures that bolstered Days Two and Three with such delight were on their way out. Finally the real November was coming for us. 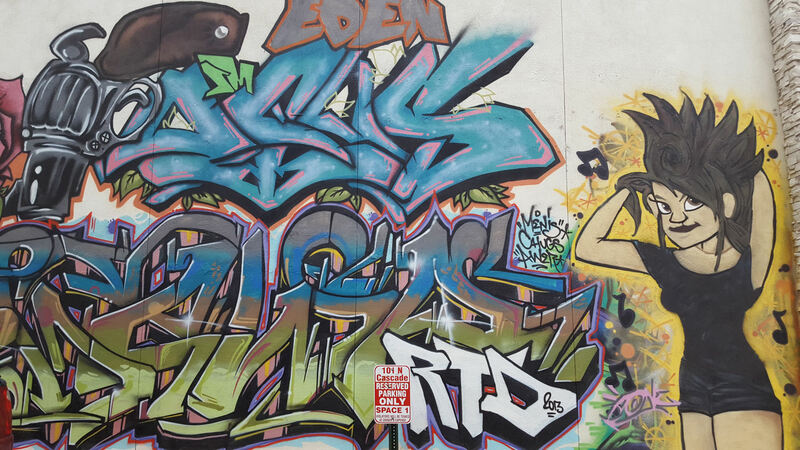 So a bit of street art was all I caught on the way back to the car. And thankfully not my death of cold with it. Behold the Rocky Mountains in their increasingly threatening majesty as I called it a day and returned to the hotel for a rendezvous with Anne. Day Four’s sightseeing more or less ended here, though we’ll come back to the restaurant portions in a later entry. Remember the gorgeous views in previous chapters? If the Rockies were a heinous felon, this would be the “AFTER” shot in their Forensic Files episode.